How Should a Wedding Ring Fit? Your wedding ring will be on your finger for decades to come, so getting the perfect fit is essential. It's also a good idea to check periodically to make sure your ring is still comfortable and secure and that it doesn't fit in an unattractive way. Understanding how to get a great fit is important if you want to enjoy your ring in comfort. If you grasp the ring with your other hand, a gentle tug should get it over your knuckles. You should be able to turn the ring comfortably while it's on your finger. The ring should fit straight across your finger, not tipped to one side or other. When your remove the ring, it's normal for the skin to be slightly compressed where it was. 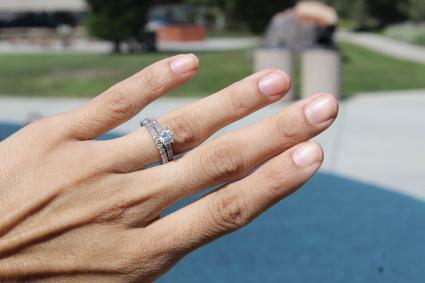 Your ring should not create a "muffin top" of skin on either side of it. You shouldn't notice pain or tingling in your wedding ring finger while you're wearing your band. Not everyone has the tapered fingers of a hand model. Hands come in all shapes and sizes, and the way your wedding ring fits will depend on the type of fingers you have. If your knuckles are bigger than the finger on either side of them, you'll need to make sure your ring fits over the knuckle but isn't too loose on the finger itself. You should have to pull to get the ring off, since the knuckle will be the only thing keeping it on your finger. If your fingers are bigger than the knuckles, you'll need to choose a band that's tighter than you otherwise might select. Your knuckles won't keep your ring on your finger, so the ring needs to be snug to keep from losing it. If you the tightness bothers you, you can select a narrower band to help make it more comfortable. You can use a printable ring size chart to check the size of your ring and compare it against the size of your finger. You can take your ring to a jeweler and have it measured. Then ask the jeweler to measure your finger as well. You can compare the fit of your ring to the fit of another ring that is comfortable for you, such as your engagement ring. Your wedding ring won't fit exactly the same way every day. In fact, within the space of a single day, your finger can change by 0.7 mm. This may not sound like a lot, but in terms of ring size, it's huge. There are several environmental factors that can make it too loose or too snug. The temperature outside can have a drastic effect on your ring's fit. On hot days, your fingers may swell, making the ring feel too snug. On very cold days, your fingers may contract, making the ring very loose. If you work out or do something strenuous, your body sends extra blood to your extremities. This can cause your ring to feel too tight as your fingers swell temporarily. For some people, eating a lot of salt can also result in swollen fingers. This can cause your ring to feel a bit tighter. If you're expecting, you can also expect some swelling of your fingers. The additional fluid your body produces to help support your baby can also cause your hands to swell. 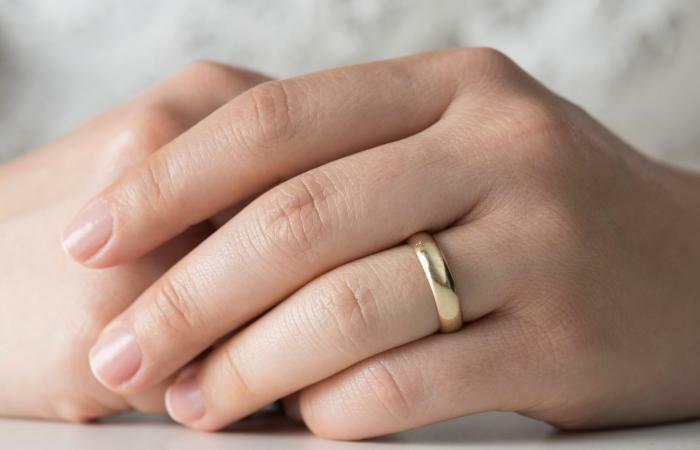 If your wedding ring fit properly when you got it but becomes snug while you're pregnant, it will likely go back to fitting again after the baby arrives. Although it doesn't change the size of your finger, the style of the ring you choose can also affect the way it fits. Narrow bands are more forgiving of sizing, as they don't compress your finger in a very large area. Wider bands can be a bit more challenging. Because a wider band covers more of your finger, it will feel tighter. You may need to have a slightly larger size to compensate. Ultimately, there's not just a single guideline about the fit of a wedding band. Each ring and each finger are different, but if you get the proper size and try some options on, you'll be able to securely and comfortably wear your ring for the rest of your life.